Apartments on William, first conceived way back in 2013 with Caliber Properties and its partners, is a sure hit considering student accommodation is like hen’s teeth. 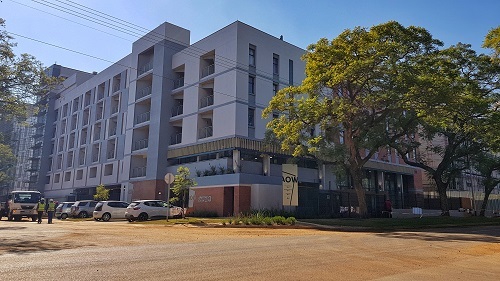 Placed on four stands directly opposite the University of Pretoria and next door to a proposed bus rapid transit (BRT) station, Apartments on William are located on the south-eastern corner of Lynnwood Road and William Street in central Pretoria. 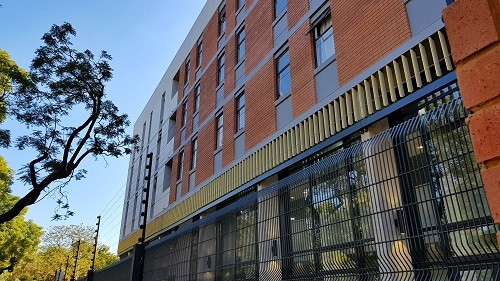 The William was conceived to be ‘a modern and structurally sound building that comprise the maximum number of practical but affordable student apartments as well as certain related common facilities’. It was an important part of the brief that the architect design the apartments based on ‘unique and intuitive design concepts and principles’. The design was principally for affordable student accommodation and had to consider the limitations and rights of the future student tenants, with the intention to provide maximum privacy for each student who has their own detailed, designed fully furnished and functional compact room. Students were also to share bathroom facilities with a maximum of one other student. In the end the decision was made to create an intimate, homely student living atmosphere by grouping small numbers of students in the various apartments. 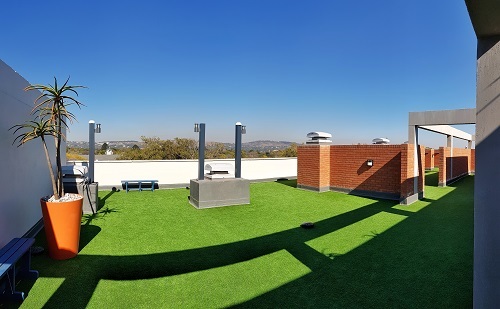 Common facilities such as a central study hall, various common recreation areas, a kiosk, braai areas on the roof, a common laundry as well as admin offices were added to enhance life for the students at the apartment block. The building comprises of various blocks, varying in height from ground floor plus four storeys to ground floor plus seven storeys. The basement of each building contains parking, storage and common services (electricity, hot water heat pumps). The ground floor is where tenants find the two pedestrian entrances as well as the main vehicle entrance, the kiosk, the admin offices, part of the common study hall, parking bays and outdoor living areas. The rest of the common study hall extends onto the first floor, which is also partially made up of accommodation units. The rest of the building comprises accommodation. 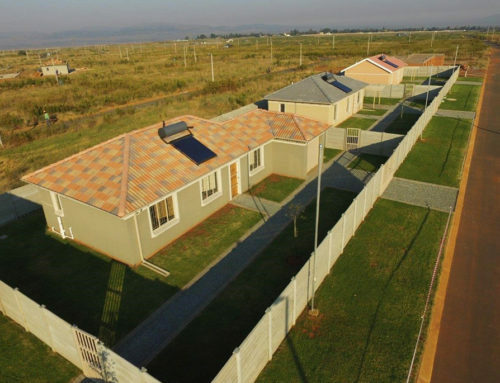 Some of higher blocks have concrete roofs which include outdoor living areas, braais as well as a drying yard for laundry, while other blocks have mono-pitch roofs. In total the complex consists of 322 student apartments, varying from about 30m² to 60m². The total area of the building, including the basement, is roughly 36 000m². The building has three lifts located at various positions, operating from the basement to the top storeys, as well as various staircases that include fire escapes. According to Deon van der Westhuizen from Deon Van Der Westhuizen Architects the design of the project commenced in 2014 and was an ongoing process up to the end of 2016. 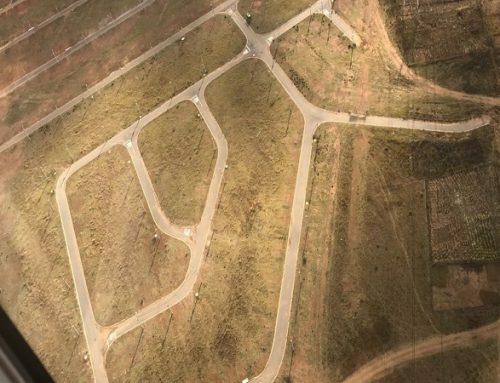 “Construction drawings and documentation commenced towards the end of 2016 and continued for the most of 2017,” he said explaining that during the same time the four stands, which totalled 5 104m², were rezoned to ‘special’ and consolidated into a single stand. Construction of the project began in February 2017 and was expected to be completed by the end of 2018. The trick with the design was to ensure that the space was optimally designed, to ensure that though the apartments may be on the smaller side, they did not feel small. The other challenge was to comply with regulations in terms of energy efficiency through the actual design of the building without compromising any of the features of accommodation benefits. Additionally, all the ceilings are insulated, hot water is provided by means of central heat pump system and all the water that enters the building is provisioned through water wise taps and shower heads. When it came to actually developing the project products were chosen mainly with affordability and speed in mind. “We wanted the building to look and feel like a quality building. 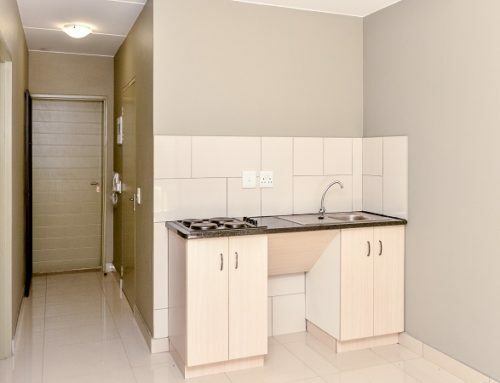 Just because the main focus was on making affordable student accommodation, doesn’t mean we couldn’t make things as good as they could be,” explains Van der Westhuizen. He adds that, as a result, the various building components were chosen primarily for their price, with the aesthetic aspect also being extremely important. 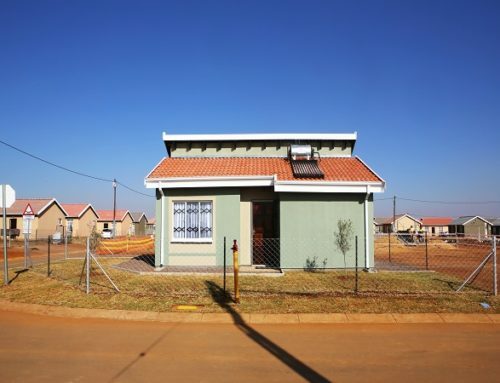 “This is why we chose to work with standard stock and face clay bricks, with in-situ concrete for the structure and flat roofs,” says Van der Westhuizen. Aluminium and timber doors and aluminium windows were chosen both for cost and their contribution to the sustainability of the building. International studies have shown that aluminium windows and doors can easily achieve improvements in heat gain and heat loss through windows by 60% rivalling more expensive timber and uPVC equivalents. Over the life of the building, energy savings with aluminium doors and windows have also been shown to outweigh the initial energy input by well over 100 times. For homes with electrical heating, or cooling for homes in hot climates such as South Africa, these savings can run into multiples of close to 300 times. It is for a similar reason that sheet metal roofs were chosen for the mono pitch roofs. Properly installed, a metal roof should last as long as the building, is effective at sealing out water and surviving high winds. Metal is also resistant to fire, mildew, insects, and rot meaning that in the long-term maintenance costs of the building are kept down. Sheet metal roofing also provides a number of other benefits particularly related to the affordability of the project. Because of the material’s light weight, savings were made on engineering and building the supporting structure while labour costs were saved on installation. Metal roofing also reflects radiant heat from the sun, minimising midday heat gain and ensuring energy savings on air conditioning during the day. 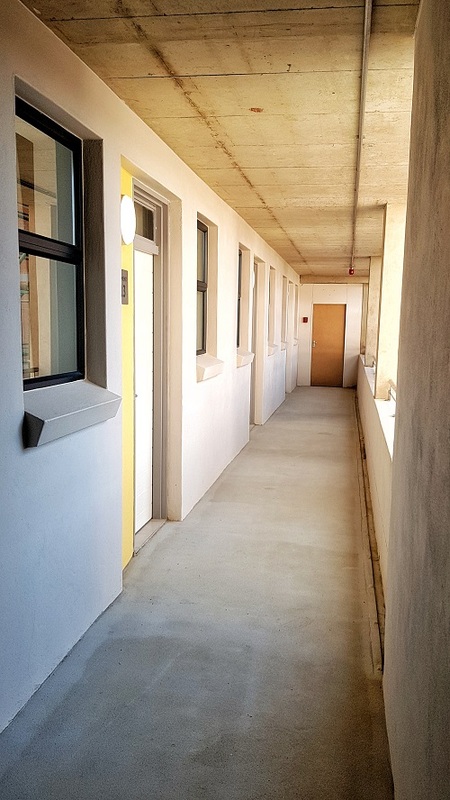 The inside of the building comprises plastered and painted wall finishes in rooms and halls and plastered and tiled wall finishes in the bathrooms. Ceramic floor tiles are used throughout in combination with smoothed concrete floors. “All of the materials are used and combined in such a way to ensure a modern and aesthetically pleasing look and feel to the building. It’s a student space that we wanted to feel fits with all the most recent design aesthetics,” explains Van der Westhuizen. 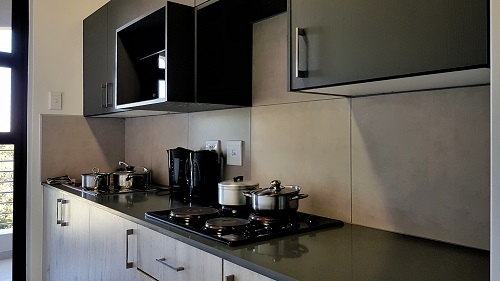 According to Albert Swanepoel, CFO of Caliber Properties, an intensive cost analysis and experience in the affordable housing market means that the Apartments on William are not only pleasing on the eye, but also delivered within budget. “The tendering procedure and supplier approvals were extremely competitive keeping in mind the current economic environment we are challenged with,” says Swanepoel. The overall result left all partners extremely pleased.